The Beatles charter a special bus for a surreal mystery tour. Compilation of almost all The Beatles' music videos, with other television appearances and live performances. Norm: Are you listening to me, Lennon? John: You're a swine. Isn't he, George? 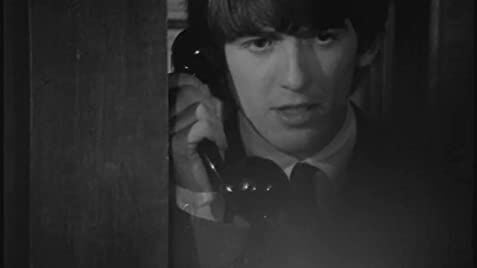 Q: Is this movie set (A Hard Days Night), where George Harrison met his future wife Patty Boyd (Jean, in the movie) ? 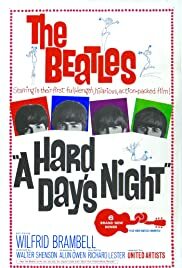 Q: Is "A Hard Day's Night" based on a book? "The Best British Musical/Comedy Film Of 1964 - All About A British Musical Pop Group Called...The Beatles!" "The first 60's film to ever waken my musical interest in pop music and electric guitars...not to mention, I wasn't even born then!" The film is full of great music and British humor by the Fab Four. It stars The Beatles themselves - John Lennon, Paul McCartney, George Harrison, and Ringo Starr in their first acting debut. The music they perform in this 'black and white' film are 7 'Lennon & McCartney' classics - from the title song, "A Hard Day's Night", to "Can't Buy Me Love" and "She Loves You". In the comedy skits of the film, The Beatles' drummer Ringo Starr, definitely leaves the other lads in a so-call 'run against time'. It's a fun and exciting film...a pop film on what 'Beatlemania' was all about back then in 1964. This classic is a must see for all upcoming Beatle fans from all around the world, as well as people and kids of all ages. "And for those of you who never felt the magic and excitement of The Beatles...like me, I promise that you will by the end of this fab film!"